Loewe is a fashion brand from Spain and like many design jewels, it is also under the super conglomerate's LVMH management. The signature products of this Spanish brand are their handbags, both for men and women. Loewe is the brand to look for if you want the ultimate handbag that has it all - style, chic, functionality, design, best materials, best craftsmen in the manufacturing process and so on. Loewe delivers it all. The company was started in 1846, when a small leather products shop was opened in Madrid. 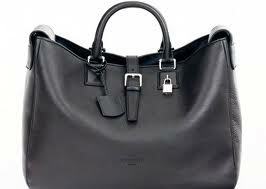 Their reputation for luxury leather bags reached the nobility of Spain and soon Loewe had very prominent clientele. The brand expanded both in terms of their product line, as well as geographically and now the brand sells women's and men's clothing, fragrances, jewelry and eyewear. What is great about man bags and Loewe bags and other products in general is the versatility, durability and the impeccable looks. This craftsmanship has been polished to a perfection and the Loewe men's briefcases are flawless both in design and manufacturing. The brand's briefcases are offered in a surprisingly bright and varied color choice, for example you can order sky blue Loewe briefcase, purple briefcase, dark red, and of course the classic brown briefcases and black leather briefcases. If in need of a classic and functional bag for travel, have a look at the brown calf leather carryall. It costs 1796 USD. The design is versatile so you can use this handbag for variety of purposes. Its size is 46 cm x 32.5 cm x 30 cm. In inches it makes 18.1" x 12.8" x 11.8". Inside there is a slip pocket, plus additional zipped pocket. Card holder included. Sold online with worldwide shipping. 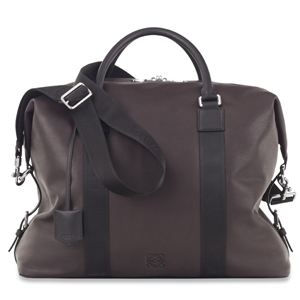 Loewe men's bags have various size men's messenger bags. And each and every of the Loewe bags are made with an outmost attention to the slightest details. These bags are among best of the designer leather handbags. You can also buy authentic designer handbags with lower price online, however the wisest and safest option is to wait for designer handbag sale and then buy Loewe bags.